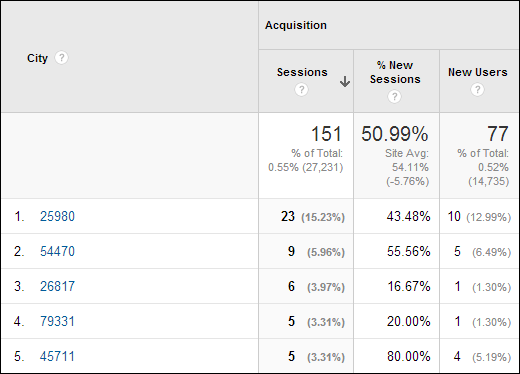 Google Analytics is now recording Post Code data for visitors to websites across Europe. Rachel McCombie of Air Experiences was the first to spot the change. This is great for direct mailers, whose businesses are very much focused around postal regions. If it’s accurate, it allows you to judge response from particular regions. Allows you to attribute sales to catalogues that you previously may not. It’s probably good for charities, political parties, and other campaigners. Many of these businesses have a ‘local’ focus, for example political parties tailoring messaging by postal code, and using local volunteers. Population data, to understand your traffic in areas vs the actual size of the population. 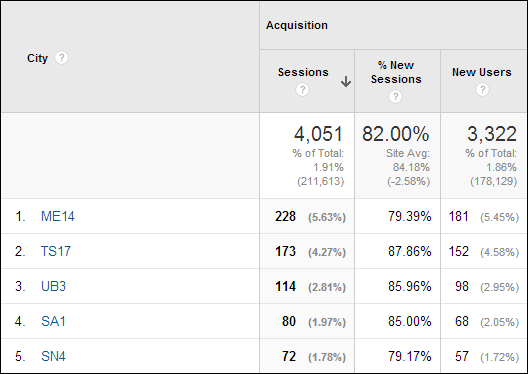 The first caveat is, we do not know how this data is being collected, or why it seems only to cover a percentage of traffic. Update: A final caveat is: Martin Macdonald spotted an oddity with an ‘ME14’ postcode appearing to be very popular. 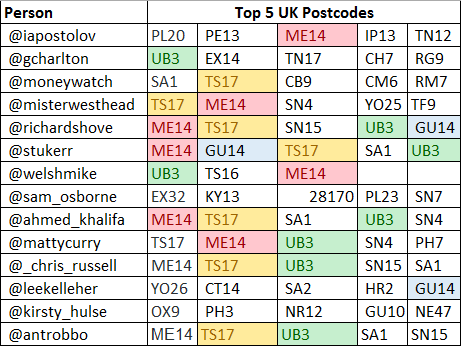 On further digging, the same postcodes seem to appear again & again among the top 5 for different accounts. Speculation (from @scottjlawson & @davecatley) is these may be large internet exchanges/providers. Audience > Geo > Location. My hope is that this data will remain in Analytics. Ideally it would be in an additional dimension (‘Postal Code’) rather than being shoe-horned into the ‘City’ field, and would cover the US and other regions. If you have any thoughts about any of this, do share them with me (@danbarker) on Twitter, or leave a comment below. I wonder if I were to record the GeoIP postcode from MaxMind or another service in a Custom Dimension and compare this whether there would be much discrepency. Need to investigate, unless there are any volunteers! !